This post is from our Party Tip contributor Dawn…Hello everyone! This is Dawn from Not Just A Mommy and I’m so thrilled to be here for my first post as a Party Tip Tuesday Contributor. I love Valentine’s Day, it’s one of those holidays that doesn’t seem to hang around for months (I’m talking to you, Christmas) and is so fun to get creative with. 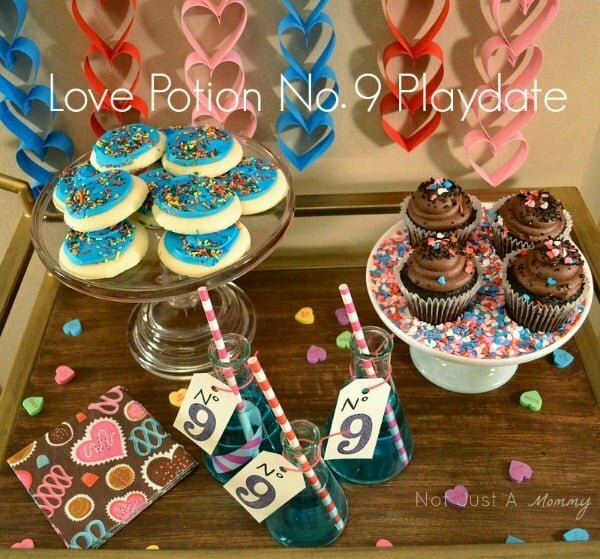 Today, I’m sharing a easy way to have a little fun with a few friends, a Love Potion Number 9 Playdate. I scored on my beakers from Amazon but any clear class or cup will do. Just attach the tag with a little piece of decorative tape like washi tape or a sticker. Store bought treats are getting prettier and tastier! I couldn’t believe my luck with these blue cookies, they were the perfect shade. 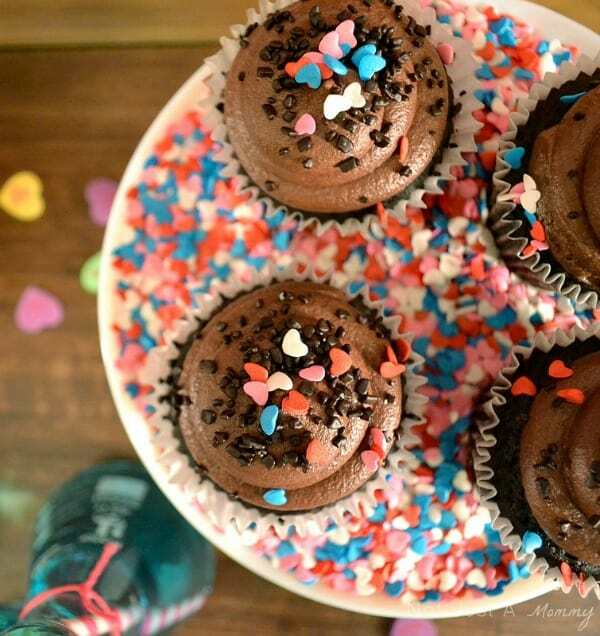 If I have the time, I love to make cupcakes…but today wasn’t the day. I picked up my favorite ones, but added the heart sprinkles, another score from Target’s Dollar Spot. Don’t be afraid to add them as decoration, I filled the cake stand with them as an added touch. 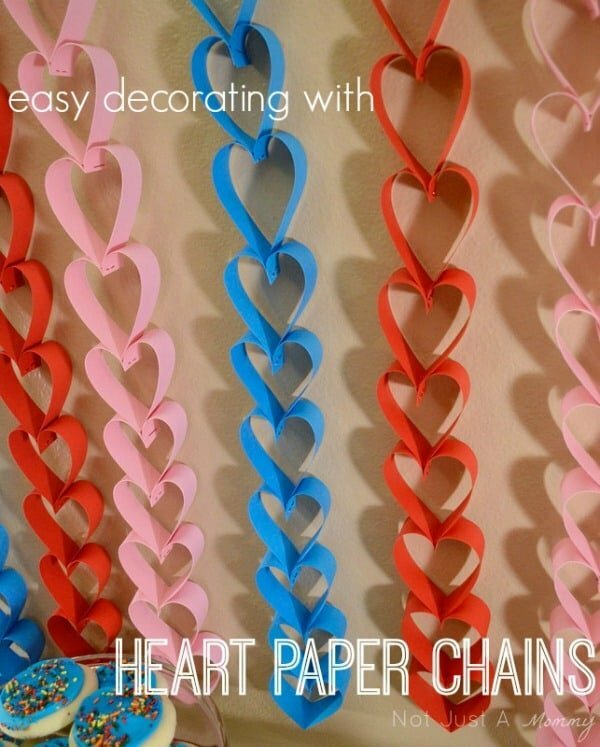 The best decorating tips are the simplest…you can make heart paper chains and the kids can help. Make a bunch and decorate your space with them! Start with a sheet of paper and trim from the long side, to make 11 strips. Voila, a lot of bang for not a lot of buck! 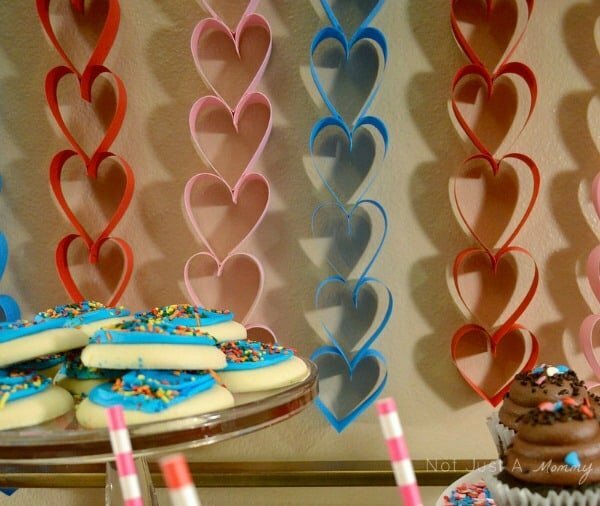 I hope you’ve been inspired for a little party fun for Valentine’s Day. Remember, it doesn’t need to cost a lot of money to make every and any occasion special. Like what you just read? There’s more where that came from…follow Not Just A Mommy on Facebook, Twitter, Pinterest and Instagram. Never miss a post by signing up by email. You can also follow the blog with Feedly. 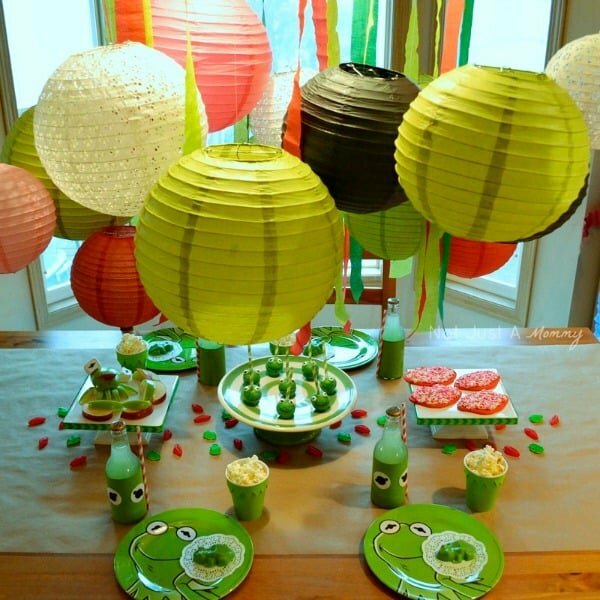 Another Valentine’s Day Party by Not Just A Mommy that I absolutely love is this Kermit-inspired Kiss Me, I’m Green party. 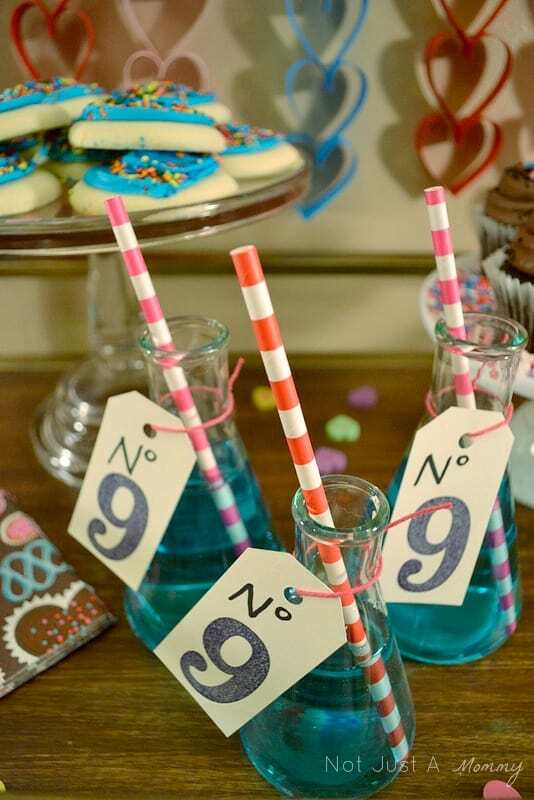 You’ll love all the little details in this party! It’s such a unique twist on a traditional Valentine’s Day Party. You’ll also find additional ideas for Valentine’s Day by visiting the Moms & Munchkins Holiday Fun page and scrolling down to February. A HUGE thank you to Dawn for sharing these creative ideas with us! 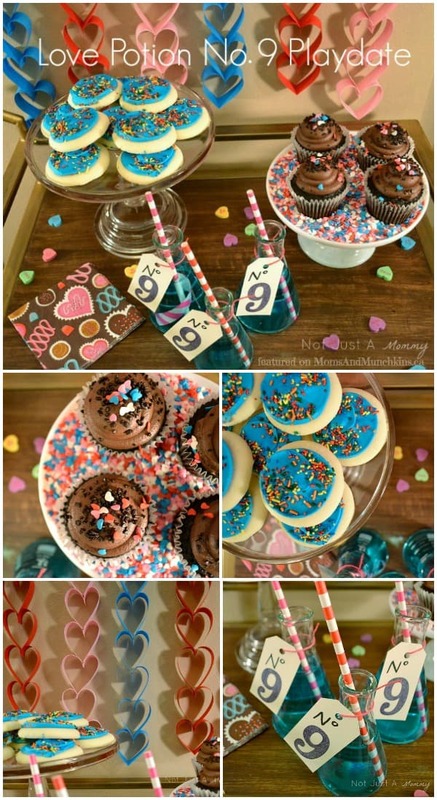 Party Tip Tuesday is a weekly feature here on Moms & Munchkins where you’ll find loads of party inspiration! 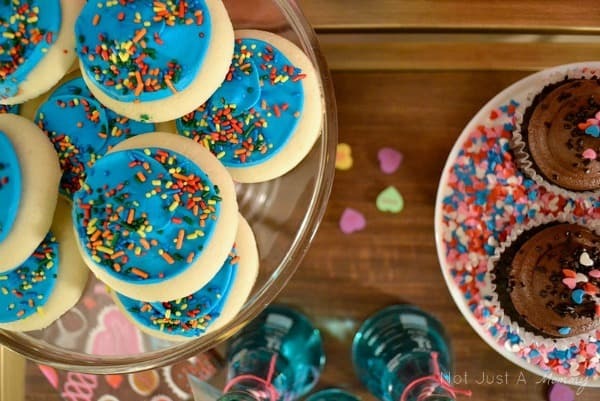 I stopped in from Showcase Your Talent – thanks for sharing these party ideas. 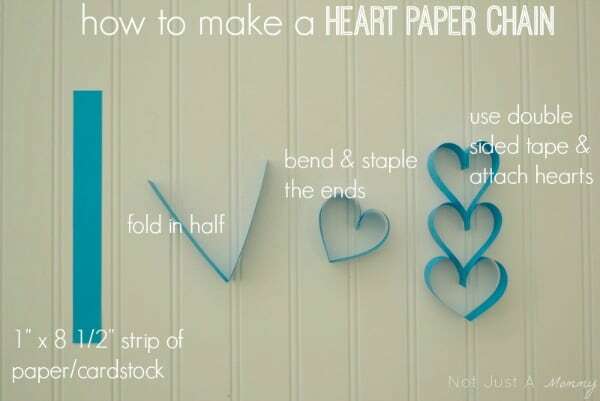 I really like the heart shaped garland!